It’s easy to get hung up over the imperfections in our technology (srsly Apple, is it that hard to give a phone a back button?) and forget just how astounding modern processing power is. A community of IT professionals called Experts Exchange has now produced a fascinating infographic to remind us. 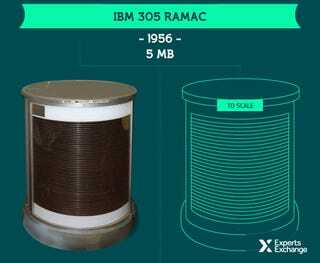 Top image: Watch as the size of hard disk drives shrinks while storage capacity increases from 1956 to 2015. The visualization below, inspired by the recent 50th anniversary of Moore’s law, tells the story of the trillion fold increase in computing performance we’ve witnessed over the past sixty years. That’s impressive enough, but some of the other finds are downright astounding. The Apollo guidance computer that took early astronauts to the moon, for instance, has the processing power of 2 Nintendo Entertainment Systems, while the Cray-2 supercomputer from 1985—the fastest machine in the world for its time—roughly measures up to an iPhone 4. Plenty of interesting insights to be found here. You can check out Expert Exchange’s original post for more info on their sources and methodology.